TEEN PATTI IS THE MOST POPULAR Card GAME IN INDIA, MILLIONS PLAYING EVERYDAY & Tubb Teen Patti is where they play. 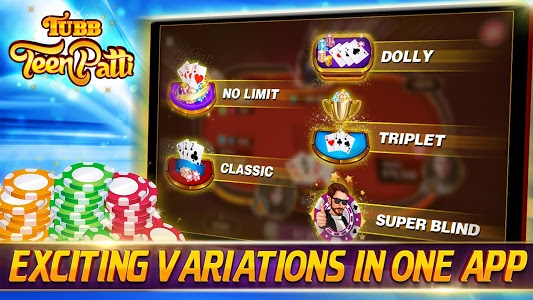 ♥ Play new Teen Patti Game Variations with real players. 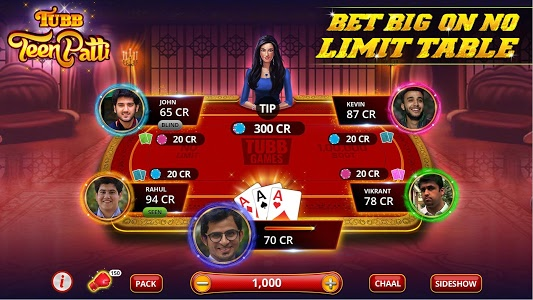 Tubb Games brings you the best Teen Patti App. You can call it Flush,Teen Patti, Tin Patti, 3 Patti, Teen Pathi (in South India) or 3 Pati. 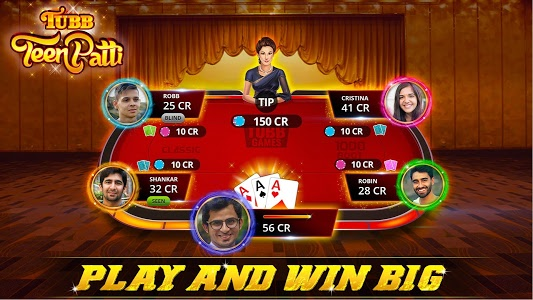 What matters is that with this app you will experience a faster, more exciting Teen Patti game! Tubb Online Games Private Limited brings you the best Teen Patti Game app. 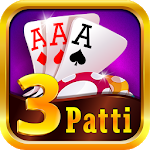 Better as compared to other Tin Patti apps, the game play experience of this app will beat all other apps of 3 pati. Apart from this Tubb offers exclusive 3 Pati variations. Download the Teen Patti game now & join the Teen Patti Club. 3 Patti game, also called as Indian Poker, is easier to play now as Tubb offers it in your most private space -- your mobile phone. Your gaming area, however, is boundless. Involve anyone you like – from family and friends to millions of Teenpatti lovers across the globe. This app’s brilliant design interface engages you with its realistic dealer and tables. Come to the table anytime to find your daily bonus chips. 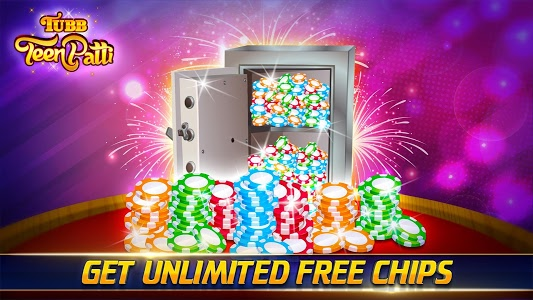 Use your 3 patti skills to win more chips using this daily bonus. Tubb brings you the best features that are available. So download the Teen Patti Game now. Exciting?! But this 3patti new online game involves no real money or an opportunity to win real money or prizes. Practice or success at social gaming does not imply future success at real money gambling/3 patti game. The player with the highest card wins. Following is the ranking for cards from high to low for tin patti. Player with the highest hand wins the game, once the pot limit is reached. In this version, the player would be dealt 2 cards, he needs to match with other 3 cards dealer places on the table. Player with the highest 3 card rank wins the game. In this 3 pati variation, all the players would be dealt 3 cards. Three cards would be triplet hand ranking. Player with highest triplet wins the game. All the players would be dealt three cards. Player can see only two cards. After the show is placed, player with the highest hand ranking wins the game. Note: Player can only see the blind folded card after the show is placed. 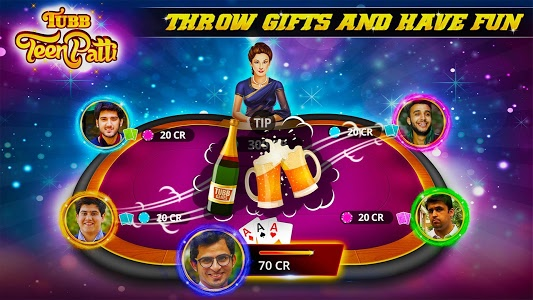 Similar to "Tubb Teen Patti - Indian Poker - TTP"